Carlos Porrata worked for 30 years as a California State Park Ranger, learning and sharing the natural and cultural history of the parks. Today, he continues to share his observations of the natural world as a wildlife photographer based in Inverness, California. Spending long hours in the wild gives Carlos a great deal of pleasure and he exhibits that enthusiasm through his passion for photography. He captures moments in time and achieves crystal-clear images of wildlife in their natural settings. His work has been exhibited in individual and group photography shows. Many of his images have appeared in local and national publications. They are also featured in the local newspaper, The Point Reyes Light. 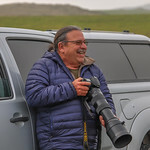 As an environmental activist he generously shares some of his images for the publications of select nonprofit environmental organizations in the Bay Area and with national and state parks. Many images in this website were taken in Point Reyes National Seashore and California state parks in Marin County, but there are also images from his trips to other national parks and public lands throughout the nation. All images are copyright, 2018, ©Carlos Porrata.